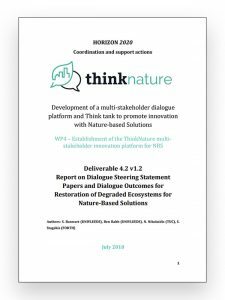 Dialogue steering was developed from background information based on the ThinkNature portfolio of 67 case studies, which included 10 examples of nature-based solutions (NBS) through restoration of degraded ecosystems. Further information was compiled from literature and the outcome of previous and current EC projects on NBS, and from stakeholder input of the regional think and do tanks. The role of restoration in increasing resilience and human wellbeing. following key messages for each topic. engaging communities, decision makers, funders and technology stakeholders. stakeholder groups required to cooperate for implementation. component to successful restoration techniques. There is still limited experience in large scale ecosystem restoration practices. messages regarding their multi-functionality, efficiency and sustainability. – Transfer of knowledge through demonstration. The outcomes of the dialogue steering on restoration of degraded ecosystems provide the foundation to further develop stakeholder engagement. Future dialogue steering will occur through a series of webinars held by the regional think and do tanks, which will be connected to dialogue on the ThinkNature Platform. The outcomes so far, and the future dialogue steering, will contribute to Work Package 5 on barrier analysis and design of decision hierarchy for restoration of degraded ecosystems for NBS, and to Work Package 7 on development of international dialogue and collaboration.